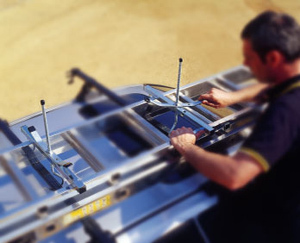 RAK CLAMPS FOR SAFE TRANSPORTATION OF MOST LADDERS ON A MOTOR VEHICLE. CAN BE PADLOCKED FOR ADDITIONAL SECURITY. FITS LADDER SECTIONS OF UP TO 380mm WIDE. CAN SECURE UP TO 3 X 2 SECTION LADDERS OR 2 X 3 SECTION LADDERS. THREADS .HOOK HAS 270mm ADJUSTMENT. AVOIDS DAMAGE TO WINDOWS , GUTTERS AND TILES. CONVENIENT ,SAFE STORAGE, INCLUDES PADLOCK AND BAR.